Picks from PRX's Editorial team. In this excerpt from the Peace Talks Radio series, learn about the history of Conscientious Objectors in the U.S. and the high profile role that the late Muhammad Ali played as a Conscientious Objector to the Vietnam War in the 1960's. In this excerpt from the Peace Talks Radio series, learn about the history of Conscientious Objectors in the U.S. and the high profile role that the late Muhammad Ali played as a Conscientious Objector to the Vietnam War in the 1960's. Archival interviews with Ali are featured along with Maria Santelli, Executive Director of The Center on Conscience and War. To be the “Greatest of All Time,” boxing legend Muhammad Ali says you have to believe in yourself. 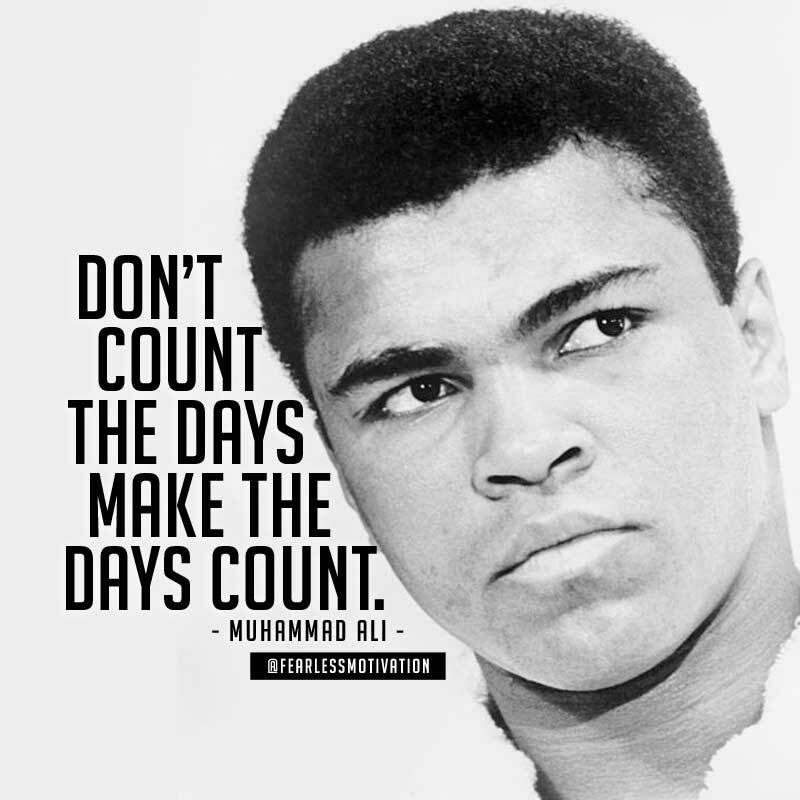 HOST: Today on This I Believe, we hear from former heavyweight boxing champion Muhammad Ali. Beyond his athletic achievements, he's known for his irrepressible personality, his public conversion to Islam, his resistance to the Vietnam War, and his humanitarian efforts around the world. Ali worked on his statement with his wife, Lonnie. They discussed with family members the stories and lessons of Ali's life. And because his speech and motor skills are affected by Parkinson's Disease, Ali asked his wife to read the essay out loud for him. But we also left a recorder at their house so, when his voice was strong, Ali could speak a few words of introduction. Here are Lonnie and Muhammad Ali with his essay for This I Believe. MUHAMMAD ALI: I’m Muhammad Ali, and this I believe. LONNIE ALI: have always believed in myself, even as a young child growing up in Louisville, Ky. My parents instilled a sense of pride and confidence in me, and taught me and my brother that we could be the best at anything. I must have believed them because I remember being the neighborhood marble champion and challenging my neighborhood buddies to see who could jump the tallest hedges or run a foot race the length of the block. Of course I knew when I made the challenge that I would win. I never even thought of losing. In high school I boasted weekly—if not daily—that one day I was going to be the heavy weight champion of the world. As part of my boxing training, I would run down Fourth Street in downtown Louisville, darting in and out of local shops, taking just enough time to tell them I was training for the Olympics and I was going to win a gold medal. And when I came back home I was going to turn pro and become the world heavyweight champion in boxing. I never thought of the possibility of failing—only of the fame and glory I was going to get when I won. I could see it. I could almost feel it. When I proclaimed that I was the “Greatest of All Time,” I believed in myself. And still do. Throughout my entire boxing career, my belief in my abilities triumphed over the skill of an opponent. My will was stronger than their skills. What I didn’t know was that my will would be tested even more when I retired. In 1984, I was conclusively diagnosed with Parkinson’s disease. Since that diagnosis, my symptoms have increased and my ability to speak in audible tones has diminished. If there was anything that would strike at the core of my confidence in myself, it would be this insidious disease. But my confidence and will to continue to live life as I choose won’t be compromised. Early in 1996, I was asked to light the cauldron at the Summer Olympic Games in Atlanta, Ga. Of course my immediate answer was yes. I never even thought of having Parkinson’s or what physical challenges that would present for me. When the moment came for me to walk out on the 140-foot high scaffolding and take the torch from Janet Evans, I realized I had the eyes of the world on me. I also realized that as I held the Olympic torch high above my head, my tremors had taken over. Just at that moment, I heard a rumble in the stadium that became a pounding roar and then turned into a deafening applause. I was reminded of my 1960 Olympic experience in Rome, when I won the gold medal. Those 36 years between Rome and Atlanta flashed before me and I realized that I had come full circle. Nothing in life has defeated me. I am still the “Greatest.” This I believe. 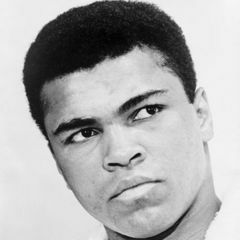 MUHAMMAD ALI: I’m still the greatest of all time. This I Believe. It was the summer of 1966 when a persistent 17-year-old with a high school radio show near Chicago got the interview of lifetime: Muhammad Ali. But only a handful of people ever got to hear this time capsule. Until now. Interview by Michael Aisner. Read the backstory below. It was in the summer of 1966 when a star-struck 17-year-old set out to interview his idol: Muhammad Ali. Twenty miles from the South Side of Chicago, in Winnetka, Ill., Michael Aisner was calling repeatedly to the gym where the boxing champ was training. Finally, a man named Mr. Shabazz — Jeremiah Shabazz, he suspects, the man who introduced Ali to Islam — picked up. “Where are you from?” Shabazz asked the boy. “I’m from WNTH, a high school radio station,” Aisner said.”The champ doesn’t have time to talk,” he said. Aisner called back two days later. And then two days after that. “Can I interview the champ?” he asked again. Later that week, with a suitcase-sized tape recorder in a back seat, Aisner and his best friend Pat were driving from the northern suburbs of Chicago to the South Side of Chicago, where Ali’s fan club was headquartered. It was two years after Ali had trashed talked his way into a victory over Sonny Liston; a year before he would refuse to go Vietnam. At the time, many black Muslims, led by Malcolm X, were advocating for “total separation” of the races. And so, for a scrawny white boy from the suburbs, heading to the heart of Chicago’s gritty South Side was no small thing. The Muhammad Ali fan club was housed in a small brick building on X street, a gold foil sign announcing itself out front. Next door was “Muhammad Speaks,” the black Muslim newspaper. From inside the club, Aisner and his friend watched out the front window as Ali screetched up in a red Cadillac convertible, parked in front of a fire hydrant, and jumped over the car door. For the next 20 minutes, Ali talked boxing, footwork, why he wanted to fight — and launched into an epic, unprompted riff about traveling to Mars and fighting for the intergalactic boxing title. All went smoothly — until Aisner realized he’d forgot to turn on the tape recorder. The interview aired a few weeks later, and Aisner went on to produce a radio show and a documentary in the decades since. But he’s never quite forgotten that first interview with his childhood icon. For 25 years, he kept the original reel-to-reel recording until he digitized it. But it sat. No one else ever heard it. Then Aisner heard about Blank on Blank. And brought his interview of a lifetime back to life. On this week's The State We're In from WBEZ: Muhammad Ali and Me. 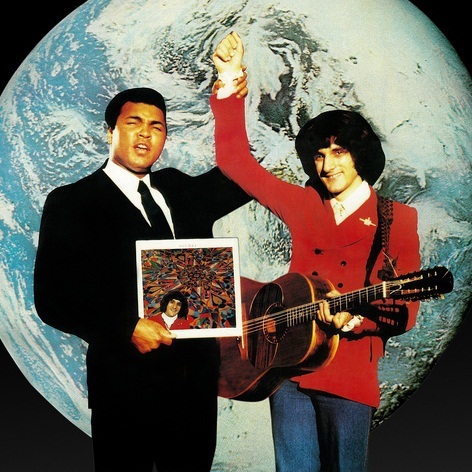 The story of how Muhammad Ali tried to make one man into a rock and roll superstar... and how he literally lost it all. Studs Terkel was a champion of a working folk and icons alike, and sometimes, he even managed to bring the two together. In this 1975 interview with Muhammad Ali, Studs asks him about how racism can be defeated by the power of outsiders coming to work together. 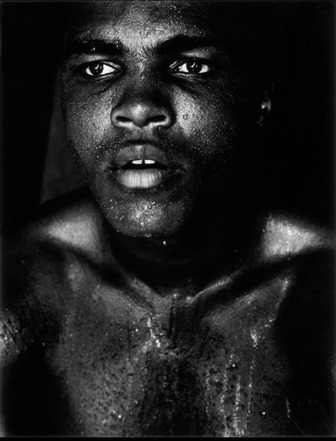 Muhammad Ali also reads excerpts from his book – The Greatest: My Own Story (with Richard Durham) – and discusses his life, touching on his childhood in St. Louis, not being served at a restaurant in his hometown after winning the 1964 Olympic gold medal, why people root for and against him, and fighting for what you believe. In this hour of Blue Dimensions, remembering Muhammad Ali with some of his recordings from the 1950s. 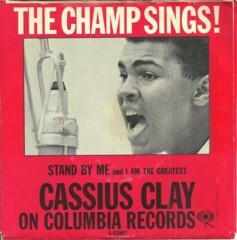 Prior to his championship fight with Sonny Liston in 1964, he recorded some skits for an album, and a couple of songs for a single, which were all reissued in 1999 on a CD called "I Am The Greatest!" by Columbia/Legacy Records. In addition we'll hear a couple of calypso songs about Ali - - calypso has always been a rich source of history and social commentary. Also, two new jazz versions of a traditional blues song, "Another Man Done Gone" from bassist Will Goble with singer Tabreeca Woodside and tenor saxophone player JD Allen, and new and recent music from some great players and band leaders, trumpeter Dominick Farinacci, guitarist Peter Bernstein, pianist Laurence Hobgood, and guitarist Julian Lage. "Float like a Butterfly, Sting Like a Bee...". This is my tribute to Muhammad Ali. An impressionistic mix of sound and music dedicated to "The Greatest" fighter in and out of the ring.